And when it tastes delicious - it's even better! No matter what you choose to indulge in, you can be assured, it will be of the highest quality. Did someone say chocolate? Rich, moist & scrumptious are three words to describe this awesome mini chocolate bundt bursting with a rich cocoa flavor. Every chocolate lovers delight! Incredibly moist with a silky chocolate glaze. Definitely one of our customer's favorite! The essence of perfection - A traditional chewy brownie, combined with a rich cocoa flavor and topped with freshly ground walnuts, yum! Our Chocolate chip fudge recipe incorporates giant chunks of chocolate chips and other fresh ingredients, bought together in a combination that will make your mouth water just looking at them! Just like grandmas! Our perfectly baked cookies provide a gooey and crisp cookie-eating adventure. They provide a delicious edible luxury! Simply the most decadent Rugelach on the planet! A classic that withstands the test of time, one bite and you'll be hooked. The 4 flavors are: Cinnamon, Chocolate Chip, Raspberry, and Apricot. Buy with us worry free! Quality, service and value are truly our most important ingredients and we're sure you'll agree every time you order from us! Buy with us worry free; your recipients will surely thank you! 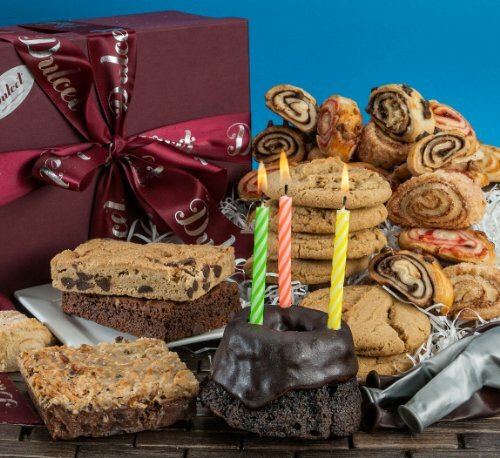 Birthday Wishes Comes True- Our unique birthday package includes: 1 Mini chocolate bundt, 1 Walnut brownie, 1 Chocolate chip fudge brownie, 6 Gourmet chocolate chip cookies, and 1/2 lb. of 4 assorted flavor rugelach that come in a variety of enticing flavors. Also includes set of 4 multi color candles to spark your unique birthday gift to life. Presentation- Distinctive and charming , thoughtfully and artfully created, each cookie individually wrapped to ensure freshness; the elegant box is accentuated with a hand tied satin ribbon. Piece by piece, Dulcet gift baskets are assembled with utmost care, artfully arranged for prime presentation. A truly gourmet food gift basket that will fulfill everyone's birthday wishes! Irresistibly Soft and Lucsios: What a sweet treat! Our delicious pastries make a profound statement to anyone! After all, what could be classier than a sophisticated assortment of gourmet cookies? It's a gift, they won't soon forget. Quality More Than Anything- Our mission has always been to create the highest quality products possible-all the time ! That commitment has yielded products like no others: deeply satisfying personal indulges that our customers just can't get enough of!